Box offers 5GB of free cloud space for your business to access and edit files, share content, and stay connected with the rest of your team from any location and from any device. Additional cloud space can be purchased within the app (25GB @ $99.99 for businesses needing some extra space) to make this app a staple to both growing and already established businesses. Create and edit Microsoft Office files directly from your iPad. Documents Unlimited offers its users the ability to create and edit Microsoft Word, Excel, and PowerPoint files all from your tablet. Gone are the days where you were restricted to your desktop, start creating and editing documents in meetings, with clients, and when you’re on the go. Dropbox has been around for a while and has found common use among file sharers across the internet. With Dropbox’s availability as a mobile app, it has become almost ubiquitous within the business environment. Dropbox allows you to access documents, photos, and videos from all of your business’s computers, mobile devices, tablets, as well as the Dropbox website. If having the full range of the iPad’s capabilities at your fingertips wasn’t enough, enter Splashtop 2 and access your desktop or laptop straight from your tablet. Whether you forgot a file on your computer or need to access an unshared document, Splashtop 2 gives its users the ability to access their computers remotely. Whether you didn’t have enough time to plug away at your computer or you just prefer the convenience of working on the go, Keynote gives its users the ability to put together world class presentations straight from their tablet device. 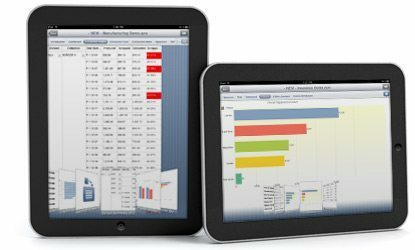 Insert data with stunning chart displays and utilize Keynote’s HDTV connectivity to display your presentation to the rest of the meeting.